There is something about driving through those green rolling hills of the South Coast that makes me take a deep breath and immediately relax. One of our favourite road trip destinations is the seaside town of Gerringong , about 2 hours south of Sydney. This part of the coast was one of our go- to holiday spots growing up, and is where I met my husband 12 years ago, so we always love going back. We’ve driven Mazda’s for a few years now but this is the first Summer we’ve had the CX9. As much as I loved the CX5 for family city driving, the CX9 is the bees- knees when it comes to extra packing space. We easily fit everything we needed- scooters, prams, beach umbrellas… and we could still see out the back! We were lucky enough to be one of the first guests at the new SOUL cottage at Soul of Gerringong - a stunning, easy living converted barn. The Soul of Gerringong has been a much-needed alternative to caravan, hotel or older style holiday homes the South Coast, so the addition of the cottage is really exciting. Both the cottage and SOUL cottage have all the creature comforts, with that beach house charm. The open plan living space with polished concrete floors and a stunning fully equipped kitchen. The beds are incredibly comfortable and made up with the most beautiful linens-the kids slept so well there. There is Netflix in every room as well as outdoor areas to relax and take in the view. There’s also a nice patch of grass for the kids to run and kick a ball, and we even had an outdoor movie night which was set up by Wollongong Outdoor Cinema Hire . If you are down South these holidays I highly recommend it! 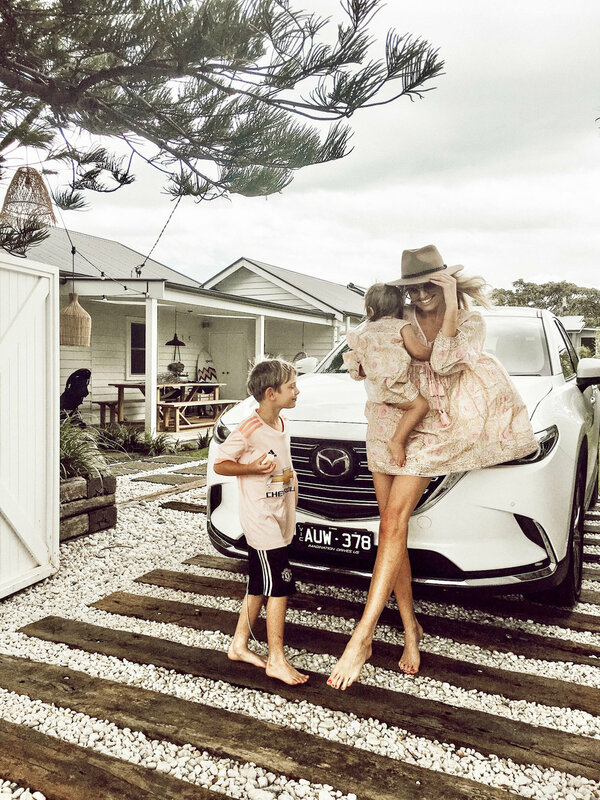 This was our second road trip of the holidays in our CX9 and as I’ve said before the tech and safety features are second to none. From the one touch boot opening to the blind spot sensor- it’s a real pleasure to drive. We have 2 more trips planned for the School Holidays and the best tip I can offer is time the drive with naps, because listening to music and chatting to your partner trumps listening to wingeing kids! Happy Holidays!